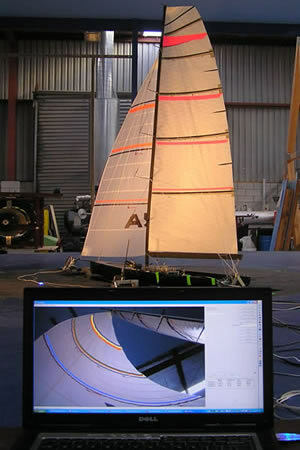 Published VSPARS sail vision and rig vision validation carried out in the world renowned Yacht Research Unit Twisted Flow Wind Tunnel facilities at Auckland University and during full scale trials confirm the accuracy of the system. High quality lens calibration and advanced perspective correction algorithms allow single VSPARS cameras to be used for each sail. Parameters such as the location and angle of the camera, and the height and length of each stripe allow accurate stripe deflections to be measured. View the VSPARS HPYD paper in pdf format. In association with the Yacht Research Unit, Auckland University. Contact us to discus the best VSPARS sail vision and rig vision package for you or find out about whats been happening with VSPARS.